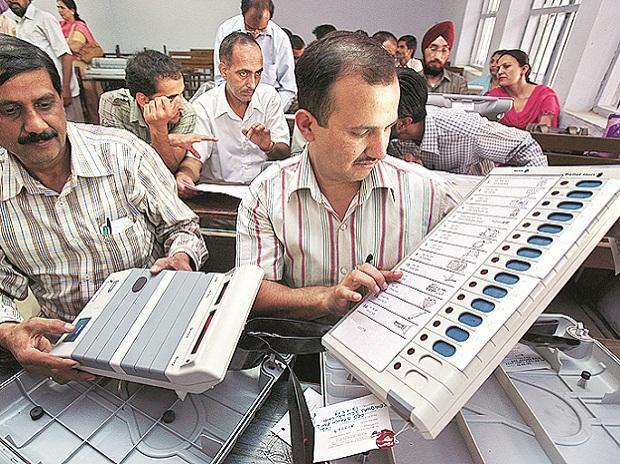 Chhattisgarh Congress MLA Kawasi Lakhma kicked up a storm after telling his audience at an election rally at Korar, Kanker district, that voters would get an electric shock if they pressed the second button on the electronic voting machine (EVM). Members of the state unit of the Bharatiya Janata Party lost no time attacking the 61-year-old, five-time MLA, threatening to take up the matter with the Election Commission. Lakhma is considered a Congress stalwart from the region and is the excise, commerce and industry minister. Polls are being held in three phases in Chhattisgarh. In Madhya Pradesh, polling will be conducted in four stages, scheduled for April 29, May 6, May 12 and May 19. Yet the two top contenders — the Bharatiya Janata Party (BJP) and the Congress — did not name their candidates for the Indore seat till about late Tuesday evening. After much dilly dallying, the Congress finally announced Pankaj Sanghvi as its candidate from the Indore seat. The party has lost the seat in each of the last eight elections. In three of these eight occasions, they were candidates from the same family. While Rameshwar Patel fought from the seat once; his son Satyanarayan Patel contested twice. On its part, the BJP is also trying to find a suitable candidate for Indore, apart from the Bhopal and Vidisha constituencies. In Indore, it is yet to decide on a candidate after Sumitra Mahajan, the 16th Speaker of the Lok Sabha, announced she would not contest from the seat. In Bhopal, the party wants a strong candidate to take on Congress veteran Digvijaya Singh. There is speculation the BJP might field Sadhvi Pragya Singh Thakur against Digvijaya Singh from Bhopal. The Confederation of All India Traders claims to have been engaged for the past three years in mobilising traders as a distinct “vote bank” in Lok Sabha polls. It claims there are 1.9 million traders in Delhi, which provide employment to 3 million people, and can influence electoral outcomes in all of Delhi's seven Lok Sabha seats. The traders' body says it is planning to launch a “whisper campaign” in Delhi in favour of one particular party. Praveen Khandelwal heads the traders' body. He had contested Assembly polls in Delhi over a decade back on the Bharatiya Janata Party ticket, and is keen to contest again on the party's ticket from the Chandni Chowk Lok Sabha seat. Khandelwal says the confederation has organised 200 meetings to make traders aware of the issues facing them. “This will be the first time that traders will vote as a bloc in Delhi,” Khandelwal claimed.